These 56 quart storage trunks from Plano make storing your outdoor gear simple and efficient. Measuring 24" by 15" by 13" on the exterior, each one provides plenty of kit space without being too bulky for the hall closet or the trunk of your car. Molded grooves on the top and bottom of each case allow them to "key" together, making stacking secure and easy, and reinforced tie-down points prevent the trunk from sliding around in transit. 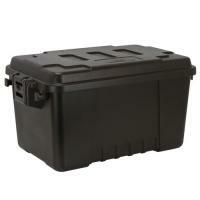 The sturdy lid is lockable for additional security, but it can also be removed for quicker access to your equipment. I would highly recommend this product to everyone who wants a trunk to load pretty much anything into. I purchased some close density foam and can carry 12 glocks with magazines safely for range time.